Begin by lying on your back on the floor. 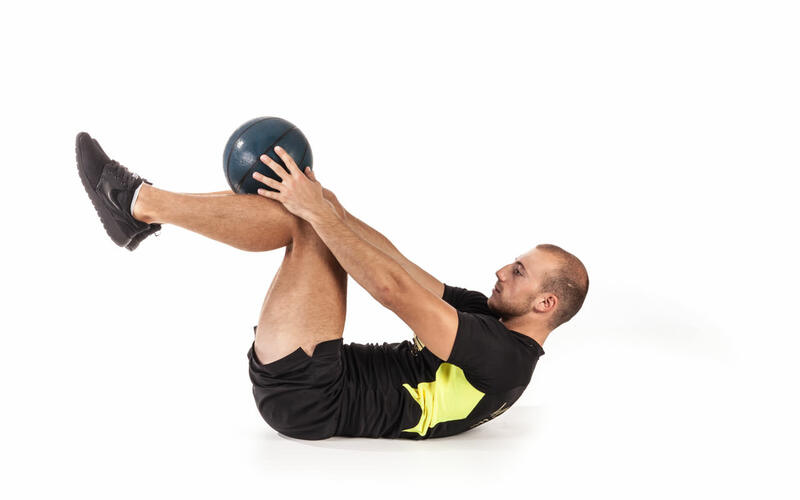 Your legs should be straight and your arms extended over your head holding a medicine ball. Tuck the knees toward your chest, rotating your pelvis to lift your glutes from the floor. As you do so, flex the spine, bringing your arms back over your head to perform a simultaneous crunch motion. Pause for a second. Lie on your back on the floor. Your legs should be lifted off the floor and bent at a 90 degree angle. 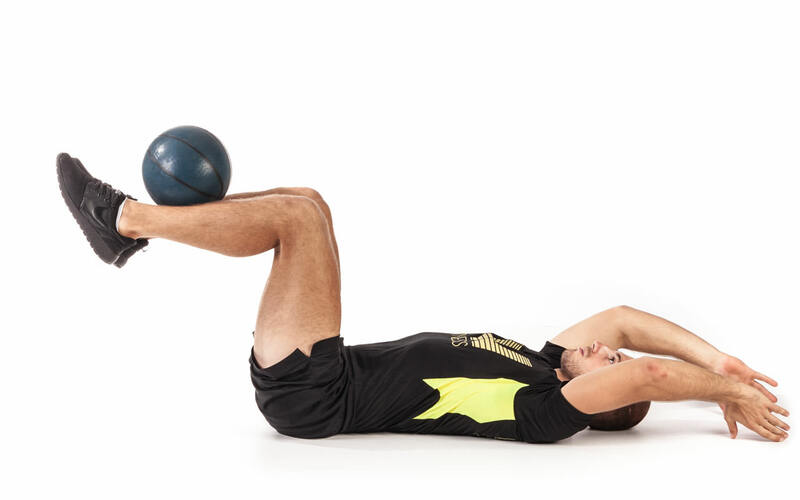 Your arms should be extended over your head holding a medicine ball. Flex your spine and crunch your body bringing your arms back over your head to the front and to perform a simultaneous crunch motion. 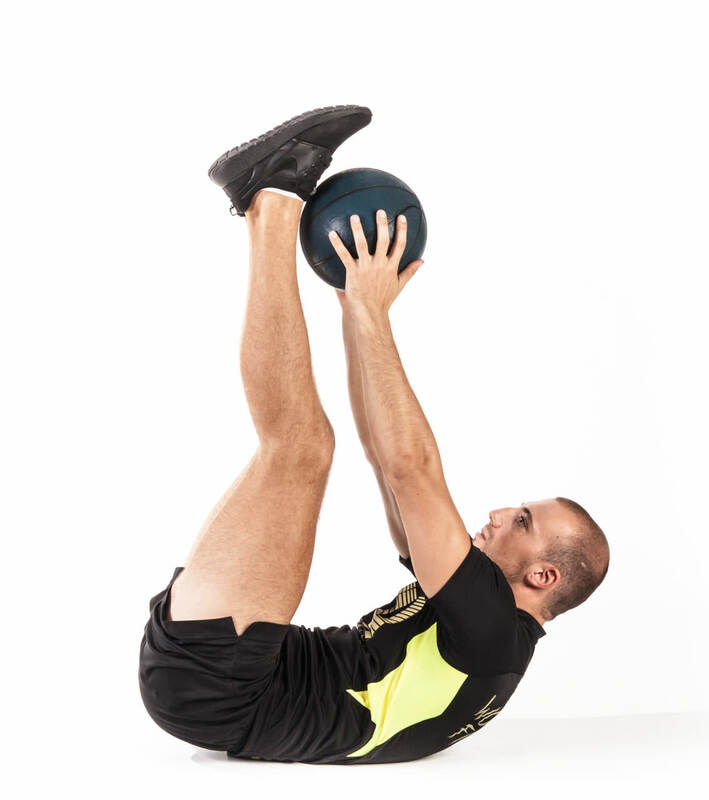 At the top position put the medicine ball on your lower legs. Return your torso back down to the starting position holding the ball onto your legs. Crunch your body again and grab a ball with both hands. Go back down to the starting position until the ball touch the floor again over your head. Repeat the exercise according to the training plan. Lie down on the floor. Your knees should be bent at 90 degrees, your heels should be about 15 inches apart and resting on the floor. Hold the ball with your extended arms over your head. 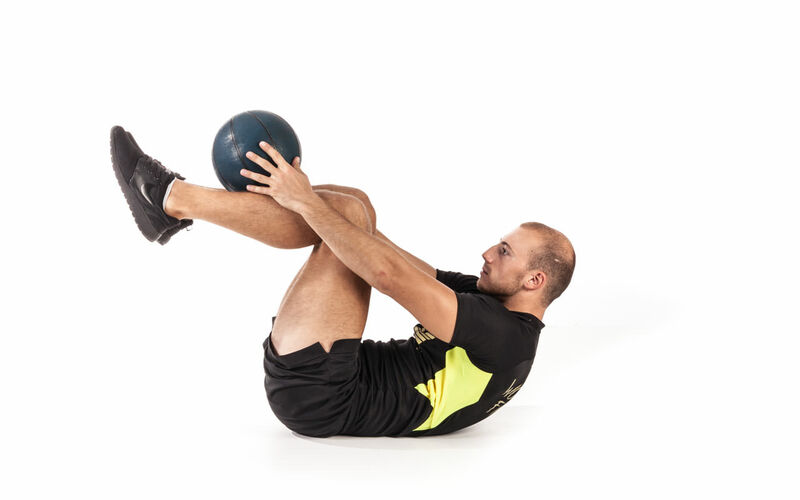 Crunch your abs and lift your torso of the floor, rotate your torso to the left, and place the ball on the floor next to you. Go back to the starting position and repeat the movement but this time rotate your torso to the right side. Go back to the starting position and repeat the exercise according to the training plan alternating sides. Lie on the floor with your knees bent. Hold the Swiss ball with your extended arms over your head. Crunch your body up and bring the ball between your knees. Go back down to the starting position, releasing through the core, slowly bringing Swiss ball back to floor and returning back flat against the floor. Repeat the exercise according to the training plan. Sit down and put a Swiss Ball between your leg’s ankles. Lean your torso back and support your weight with your hands. Slightly lift a ball of the floor. 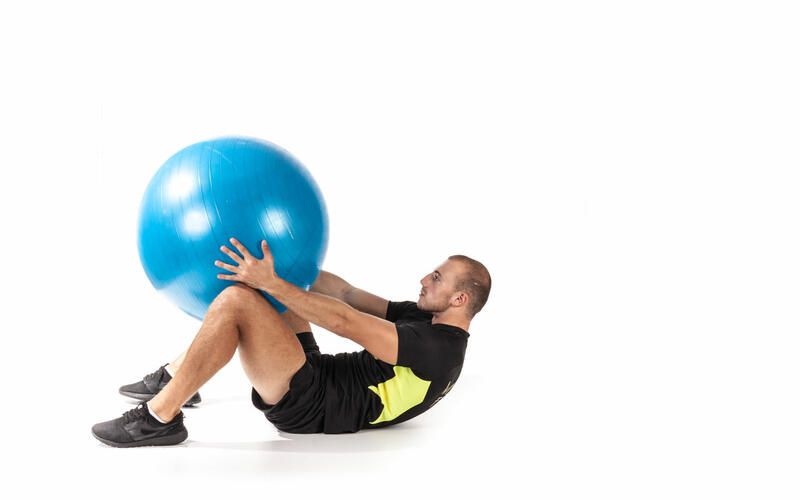 Lift your legs with the ball up crunching your abs. Lower your legs down going back to the starting position. 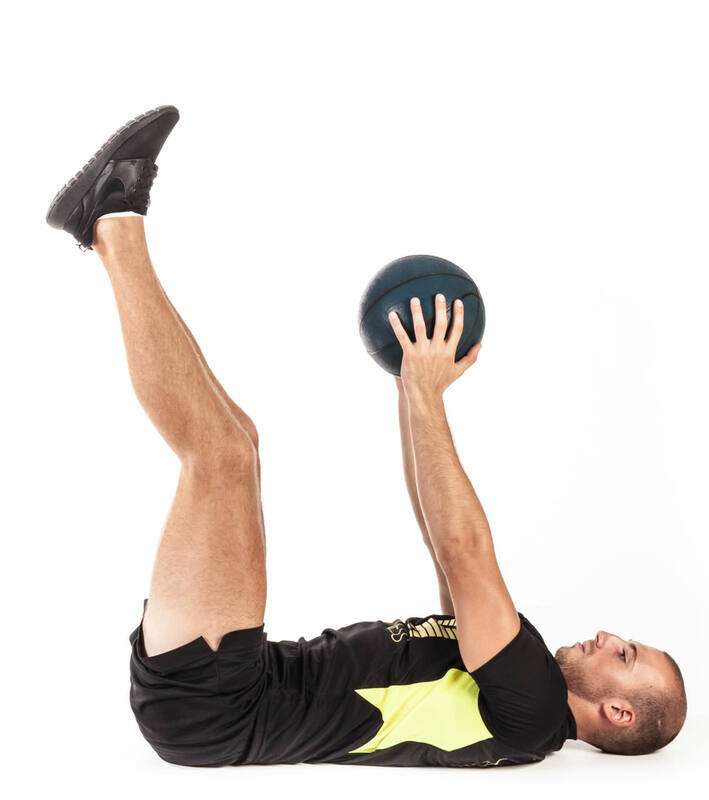 Push the legs to the left side and then push your legs with the ball to the right side. Go back to the starting position. This is one rep. Repeat the exercise according to the training plan. 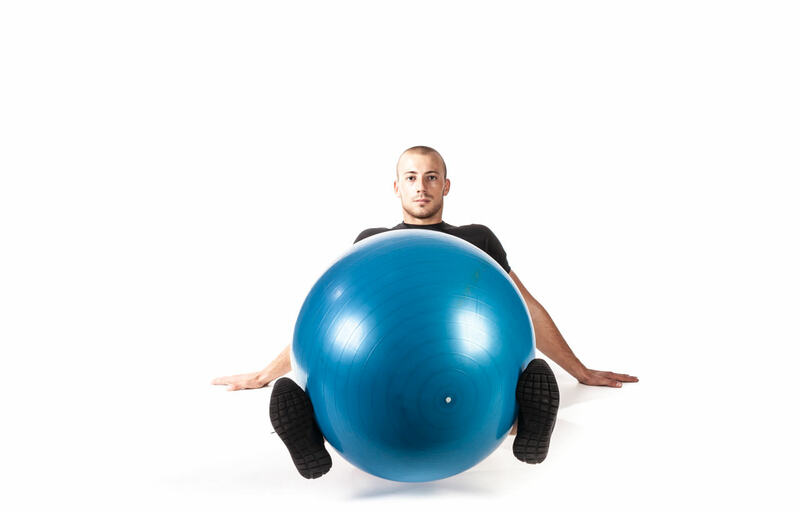 Lie on a Swiss ball with your lower back pressed against the surface of the ball. Your legs should be bent at the knee and your feet should be pressed firmly against the floor. The upper torso should be hanging off the top of the ball. Your hands should be behind the back of your head. Lower your torso into a stretch position keeping the neck stationary at all times. With the hips stationary, flex the waist by contracting the abdominals and curl the shoulders and trunk upward until you feel a nice contraction on your abdominals. The lower back should always stay in contact with the ball. Hold the contraction for a second. Go back to the starting position and repeat the exercise according to the training plan.